Location: Melbourne. Auatralia I am trying to do a knit tunic. 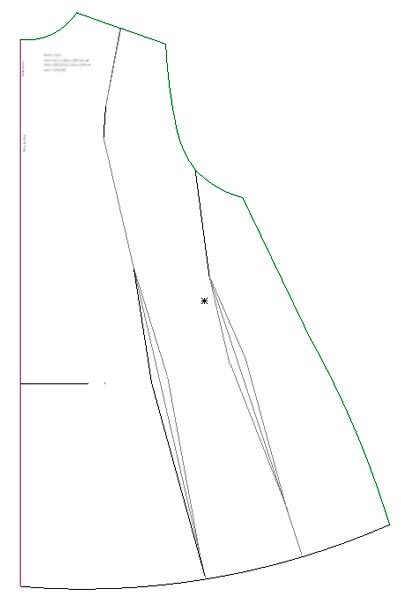 I want the front to be a long line t-shirt with no flare and the back to be flared with a curved hem. I have used the slash and pivot tool to add about 10" to the back at 1" intervals and spread 1" starting at centre back, but when it is sewn together the fabric pools at the sides and does not seem to flare from the centre. Is there a way to get the flare towards the middle. Location: Colorado Springs, CO Not sure it's doable. Need to think about it. Have you considered using a godet in the center back? Location: Norman,OK As well as adding to the cb have you moved the shoulder dart to the hem? Then slash and spread from the "notch" at the back armhole to the hem. Location: Melbourne. Auatralia thank you for your suggestions they are appreciated. I have seen this top on TV and I liked it so though I would give it a try. Will try the idea about the shoulder dart to see if it might work. I was trying not to use a godet but this might be the only thing that will work. The attachment that was sent I could not download it do not know why, but I computers are a mystery to me sometimes. Location: Eugene OR Coopie to the rescue! : ) A picture is worth a thousand words, here's a screencap of her .las file. The only thing is, if you're working in PMK, you won't have a back shoulder dart to rotate out. True. I'm afraid that I use PMB more than I use PMK. Thanks EasilyAmused! MyI intent was to suggest that there more places to add fullness (flare) than just the edges. I would probably put a seam at the CB and take the CB off grain. Thereby adding a godet. That would allow me to shape the upper back in order to keep the closer fit there. Using a yoke would be another solution. Location: Melbourne. Auatralia Thank you. What a great idea will give it a try. Some times I just do not think outside the square. It is so good that people have all different ideas how to do things. I will have to wait till grand children go back to school to try. The have one more week of holidays and it is a hands on during the day until they go home by then I am to exhausted to do anything else. Location: Norman,OK You're very welcome! If i can help let me know.